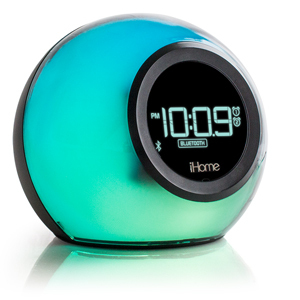 Upgrade your morning routine with the IBT29, a multifunctional and visually appealing alarm clock that not only streams audio and calls, but also features a color-changing cabinet for a range of delightful effects. Equipped with Bluetooth technology and an aux-in port, the IBT29 plays music wirelessly, yet also supports a wired audio connection. Featuring an FM radio with six-station preset memory and built-in alarm tones, the IBT29 offers a variety of options for your morning alarm. The dual alarm feature allows you to set two different alarms with separate alarm sources. Not just an alarm clock, the IBT29 boasts a built-in mic and speakerphone that offer the convenience of hands-free conversations, while digital voice echo cancellation ensures that you can hear every word. Specially-designed Reson8speakers chambers with premium drivers delivery high-fidelity sound for both your music and calls. A charmingly spherical shape and color-changing cabinet make the IBT29 not just a practical device, but also a fun one. Multiple color settings allow you to customize the hue to suit your mood, or change when your alarm rings.The IBT29 adds a playful element to your home, while supporting a number of essential functions for your active lifestyle. Play your music for hours without worry – the IBT29 has a built-in USB charging port that'll keep your device fully-charged even while you use it. A practical bedside companion, the IBT29 also lets you charge your phone or tablet overnight, so you're ready to go in the morning. Keep your nightstand clutter-free and your devices fully-charged with the all-in-one IBT29. Five eye-catching hues and six wake-up color modes add an element of charm to any bedroom. Change the color settings to suit your mood, and bring life to the party. You can set a combination of blue, yellow, green, and pink hues to greet you in the morning, or turn the color settings off for a subtler look. The unique, color-changing cabinet of the IBT29 is both amusing and delightful. The IBT29 is equipped with Bluetooth technology, an FM radio, aux-in port, and built-in tones, giving you a variety of options for your morning alarm and bedtime tunes. You can stream audio from any paired device, which includes everything from your favorite songs and playlists, to podcasts and audio books. The IBT29 also plays audio from non-Bluetooth devices and features an FM radio with six-station preset memory. Set your alarm to any one of these options, or select one of the built-in alarm tones on the device itself. With so many choices, you'll never get tired of your morning and evening routine. Thanks to Bluetooth, you can play your music without a wired connection. The IBT29 is compatible with most Bluetooth-enabled devices, including your smartphone, tablet, MP3 player and e-reader. Pairing is a simple process, and streaming audio is even simpler. You can control your music directly with on-board controls, making it easy to switch the track or raise the volume without reaching for your phone. For older devices without Bluetooth, the IBT29 features an aux-in port that works with most standard headphone jacks. Use the bulit-in mic and speakerphone to answer calls with the push of a button. With Bluetooth, the IBT29 streams incoming calls wirelessly, so you can enjoy hands-free convenience. Digital voice echo cancellation ensures that your calls are never distorted, and specially-designed Reson8 speaker chambers deliver high-fidelity sound that you can truly appreciate. With the addition of a speakerphone, the IBT29 is so much more than just an alarm clock.